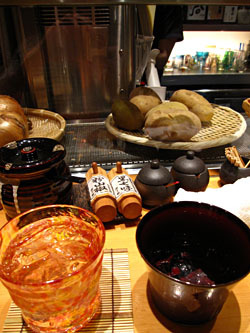 Drinking alcohol is an important social ritual that helps the Japanese to relax and serves as a social lubricant for essential bonding. If you are dining with Japanese friends or colleagues, make sure to follow these hints. Keep watch to make sure the people sitting around you have something in their glass at all times. If you aren’t paying attention, your partners will invariably keep insisting on filling your glass, even if you don’t want to continue drinking. This takes some getting used to, especially when you are enjoying the conversation. If you are drinking sake and someone holds a tokkuri, ready to pour, drink what is left in your cup before holding it up to them. Then, reciprocate. But be careful, as this custom encourages quick intoxication. If you’re not a heavy drinker, keep your glass almost full. You can certainly try to decline additional pours, but this is sometimes seen as modesty and you will be encouraged to drink up. If you’re at a business outing, you’ll probably notice that the junior members take on the task of pouring and ordering drinks. You need not worry much about this, as you are a visitor, and therefore, seen as an honored guest. The social and corporate hierarchy is difficult to understand to an outsider. However, these barriers tend to melt away, or at least soften, during excessive drinking. Many of my friends in the corporate world tell me the real conversations occur at the izakaya after work, when they are free to let loose with their feelings and opinions, even to their supervisors. The next morning, all is forgotten on the surface, but the subtext is not. Drinking is part of the enjoyment at a casual izakaya, but in Japanese culture, it's more than just fun.